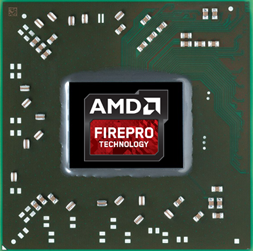 The AMD FirePro M4100 is a middle-class graphics card for mobile workstations, which has been presented in mid-2013. Similar to the Nvidia Quadro series, the FirePro cards offer certified drivers for professional 3D-software like CAD. Due to optimizations and some unlocked features, the performance in these applications is much better compared to a consumer Radeon GPU. The FirePro M4100 integrates 6 Compute Units based on the GCN architecture. Overall, the Mars chip has 384 stream processors, 24 TMUs and 8 ROPs. The memory of up to 2 GB GDDR5 is connected via an 128-bit interface. Just like the Radeon series, the FirePro M4100 offers features like Enduro or PCIe 3.0, but no Eyefinity. According to the clock rates of up to 670 MHz for the chip and 1000 MHz for the memory (4000 MHz effective, 64 GB/s), the 3D gaming performance is slightly below the older FirePro M4000 or the Nvidia Quadro K1100M. Recent Games of 2013 can thus be played fluently in medium details and a resolution of 1366 x 768 pixels. The FirePro M4100 features different energy saving techniques to reduce power consumption and prolong battery life. These include PowerPlay and PowerTune (for clocking the GPU), Zero Core (deactivates parts of the GPU when the display is off) and Enduro (dynamic GPU switching between the processor graphics and the dedicated Radeon GPU). The maximum power consumption under full load should be around 30 watts (estimate), making the card suitable for laptops 15 inches in size or greater.